Does QuickTime has MP4 support? QuickTime is an extensible multimedia framework powered by Apple Inc., which has the feature of handling various formats of digital video, picture, sound, panoramic images, and interactivity. According to Apple Support Website, QuickTime can only support MPEG-4 (.mp4, .m4v), but MP4 is a complex video container with various video and audio codecs. That is to say, if the MP4 video contains QuickTime unsupported audio or video codecs, QuickTime will refuse to play this kind of MP4 files. This is the reason why people usually feel frustrated when they try to play an MP4 file in QuickTime. Any solution to open every MP4 file on QuickTime? In order to make every MP4 video acceptable by QuickTime Player, the only solution to rewrap MP4 to QT MOV on Mac if you want to put MP4 videos to Mac QuickTime faultlessly. Without any question, a video converter for Mac can be a timely help. Here you can rely on Pavtube Video Converter for Mac since this program not only serves as the best yet MP4 to QuickTime MOV Converter for Mac but also makes perfect synchronization with Mac OS X El Capitan, letting you easily import MP4 video to QuickTime for watching while holding the same video as original. Besides MOV output for QuickTime, it also offers a lot of formats for other devices such as Kindle Fire, iPad, iPhone, Samsung tablets, Apple TV, etc. For windows users, refer to Pavtube Video Converter. Now, download the software on computer and follow the guide below to start conversion. How to Encode MP4 to QuickTime formats for playing without any problems? Step 1: Install the Mac MP4 to QuickTime Converter. As long as you launch it, the following main interface will pop up. Now you can click on “Add video” button to import MP4 files which you want to convert into this program. 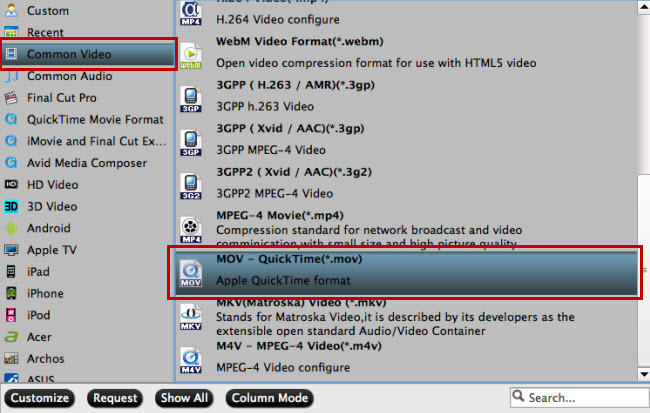 Step 2: Hit the drop-down list of “Format” to choose “Common Video -> MOV – QuickTime (*.mov)” as the target format. This MP4 to QT MOV Converter also offers the QuickTime Movie Format for you. Just choose it. By clicking the Settings icon, you can adjust video and audio parameters like codec, bit rate, frame rate, sample rate, etc., in that way, you can take charge of the size and quality of the output MOV files. In principle, the larger input values, the better output quality, but the corresponding larger file size.